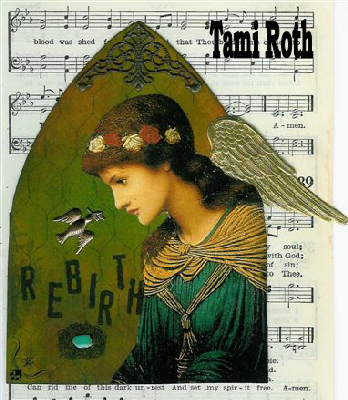 Our hostess this week is Tami Roth who has selected the theme of “Renaissance” as our challenge this week. Isn’t her arch just beautiful!? What do you think of when the word “Renaissance” comes to mind? We want to see it here this week in gothic form! Renaissance marks the period of European history at the close of the Middle Ages and the rise of the Modern world. It represents a cultural rebirth from the 14th through the middle of the 17th centuries. Early Renaissance, mostly in Italy, bridges the art period during the fifteenth century, between the Middle Ages and the High Renaissance in Italy. It is generally known that Renaissance matured in Northen Europe later, in 16th century. The term renaissance means rebirth and is used to mark an era of broad cultural achievement as a result of renewed interest in the classical art and ideas of Ancient Greece and Rome. The main idea of rebirth lies at the belief that through the study of the intellectual and artistic treasures of the Greco-Roman antiquity, inspired by Humanism, can be reached the artistic greatness, wisdom and enlightenment. Thank you, Nancy, for the opportunity to be hostess for the gothic arch challenge this week! I chose this theme because of my love for the art and images from that time. 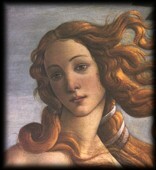 “Venus” by Sandro Botticelli is probably my most favorite painting. I think of Botticelli, daVinci, Michelangelo, Vermeer, etc. I love the colors the artists used-so deep and rich. Renaissance means “rebirth” but can have so many meanings to different people that I hope everyone can go with their first instinct of what this means for them and have fun with it! This weeks theme is “Royalty/Crowns” which was selected by our hostess Kris Dickinson. Isn’t her arch just beautiful! What comes to your mind when you think of Royalty/Crowns? Kings and Queens? Fairy Tales? We want to see it here this week in gothic arch style! Thank you Nancy for choosing me to host the Gothic Arch Challenge this week. I chose the theme Royalty/Crowns as I’ve always been fascinated with the kings and queens of Europe. In particular, The Romanovs of Russia. Such a beautiful and tragic family. 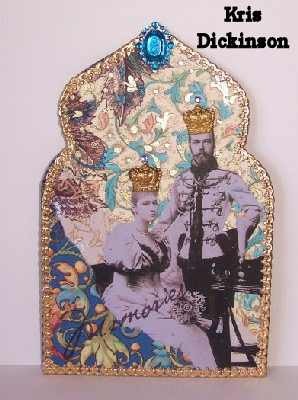 I have chosen Nicholas II and Alexandra of Russia as my subject for my arch. For this challenge, please do not limit yourselves to just actual royalty. Alter a little king or queen or crown a bird, etc…I can’t wait to see what you create! Kris Dickinson resides in Parker, CO and has been creating collage’ and mixed media pieces for many years. She is married and has a 9 year old daughter. 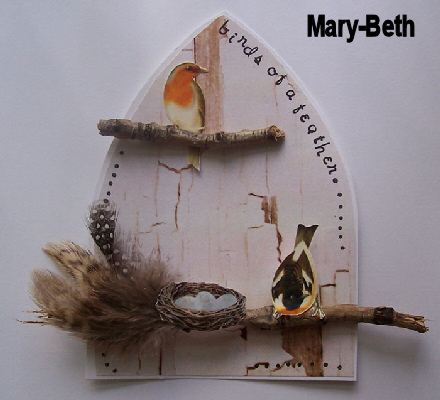 Our theme this week is “For The Birds” which was selected by our hostess Mary-Beth. She made this beautiful arch which includes items found in nature. What do you invision with the theme “For the Birds”? We wish to see it here in gothic arch form this week. I was so happy that Nancy asked me once again to host G.A.. I love doing these arches and have fallen behind in the fun. Lately I have become much more interested in photography, mainly taking landscape shots to use in my art and picking up fallen treasure from the ground especially after rain storms. These twigs came in handy for my arch this week and actually inspired it. I can’t wait to see how everyone interprets the theme of “For the Birds” this week. Have fun!!!!!!! This week our theme is “Handwriting” which was selected by our hostess Dymphie. Dymphie has created this beautiful arch using her own handwriting…and states:Use your own handwriting on the arch, paint a few letters, calligraph a quote (i would looooove to see that). I don’t like my own handwriting very much, but i like to use it in my art-work, it seems more my own when i do so. We want to see your handwriting on your arches this week! Our hostess this week is Louise Granlund who selected the theme “Patriotism” and made this beautiful arch. I chose the theme of Patriotism because we are celebrating the 4th of July this weekend in the United States. Our neighborhood will be filled with flags waving from front porches. We will go to the parade our community puts on every 4th of July and young and old will be waving flags as the parade passes by. I always cry when the various veterans groups walk by and eveyone stands and applauds them. At night we’ll watch the fireworks display at the local high school. Patriotism is a universal theme — love of one’s country. Or maybe it’s a country you’ve visited and have a close affinity to. Whatever the case, share your gothic arches saluting a country close to your heart. Kelly is a self-taught artist who loves collage, rubber stamping, and mixed media! She finds nothing more rewarding that turning a blank piece of paper into a piece of art! 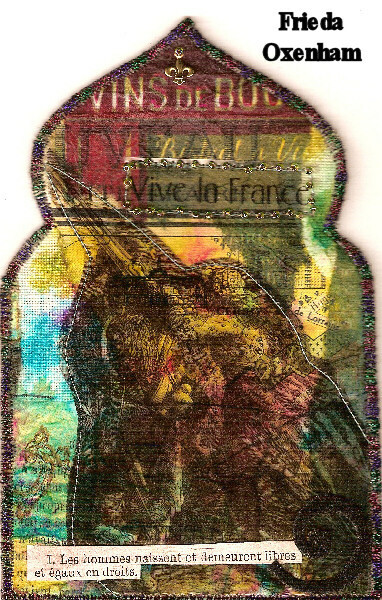 Our theme this week is “Viva la France” which was selected by our hostess Frieda Oxenham. Frieda made this beautiful arch for our challenge this week. We want to see your celebration of all things French in gothic arch form. I’m an award winning quilt artist whose work has been exhibited both nationally and internationally and has won many prizes;. 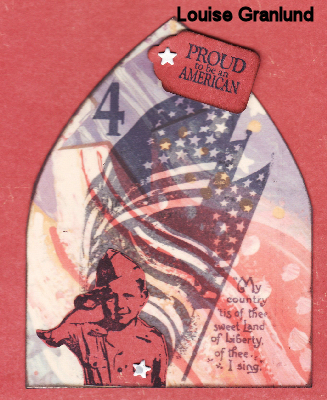 I’ve also become known for my ATCs and mixed media work, winning Best of Show for my Enduring, Unending ATC in the House of Cards exhition, Columbus, Ohio, 2005. My mixed media work has been published in Somerset Studio, Somerset Gallery and Sew Somerset . I also work for Alphastamps as part of their Design Team. 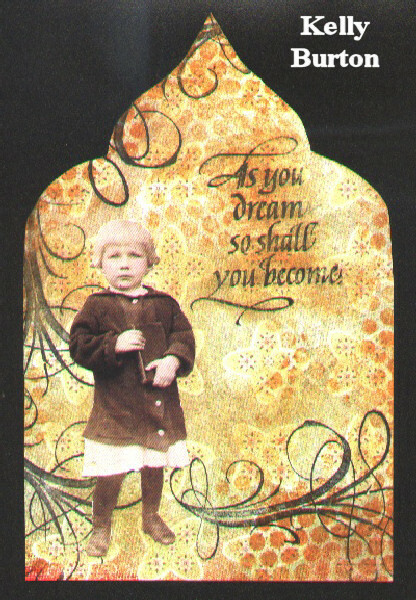 From ATCs I’m progressed to Inchies, Itty Bitties and now Gothic Arches, which are becoming a real obsession for me! The theme this week is Vive la France. I have an abiding love for France and the French language. France was the first country in Europe to draw up a Human Rights Declaration in 1789 during the French Revolution, based partly on the American one. It had a huge influence on human rights in the rest of Europe as well. 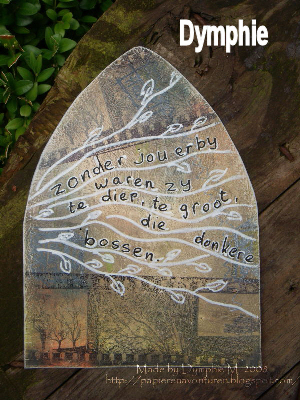 The first line is part of my arch and translated reads: Men are born and remain free and equal in rights. Notice however that women are not yet mentioned despite the fact that they played their part during the Revolution too, which is why I have featured a woman on my arch!